An interesting and unusual note in the Southwestern - - Springhill football game was the fact that a brother and sister were cheerleaders for each school. 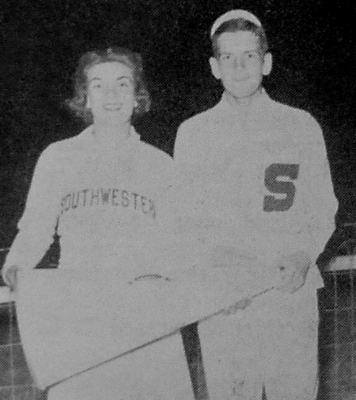 They are Margaret McMillan (left), varsity cheerleader for Southwestern, and John Henry McMillan, Jr. (right) a Freshman at Springhill. The photo was taken during the game at Mobile, Alabama. And an interesting note for the readers of Alumni News is the fact that these two cheerleaders are Southwestern's "Grandchildren" - - being the stepson and stepdaughter of Aline Estorge McMillan '23. T-Bine, she actually hired my wife (Terri) to teach at UL when she headed the PE section for the ladies!! !